1/2 way through my holiday season now! After the next 4 weeks, I am treating myself to the whole month of December OFF, free from branding clients as well as regular outdoor family sessions… lots of babies due in December though and I could never turn them away! Very excited for next month, all of the newborns, the holidays, parties, and most importantly LOTS of quality time with my family. It’s going to be a very nice break. Last year, I didn’t have the heart to turn any clients away and literally shot up until a few days before Christmas. So this year, I vowed that I would not do that again! I made sure everyone booked for the holidays EARLY! For now, I have 4 more weeks of shooting gorgeous families and I am A-OK with that It has been lovely meeting so many new families and having a chance to catch up with past clients. All in all, the past couple of months have been great and I could not ask for much more. 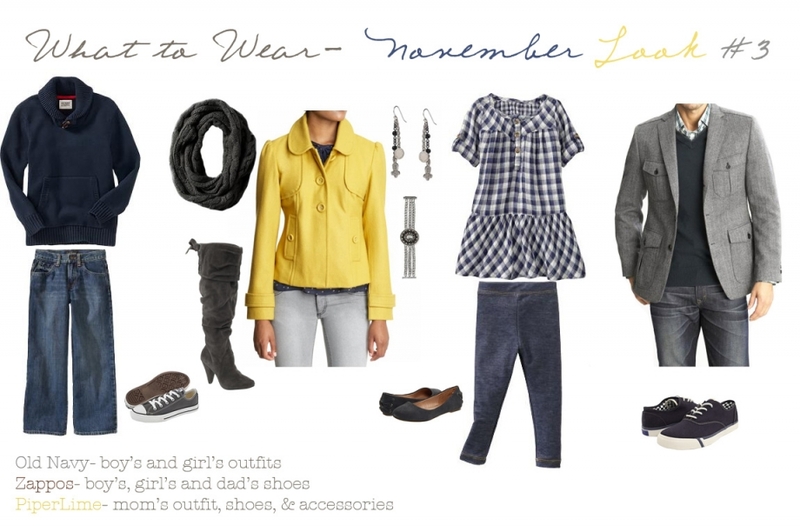 With that, the November “What to Wear” guides are now available! This month I wanted to give people a couple of options for looking “holiday” without being over the top “This is my CHRISTMAS” outfit. I am really really not a fan of matching outfits (no offense to those that are… just personally not my thing). I have said this many times before and will say it again…. 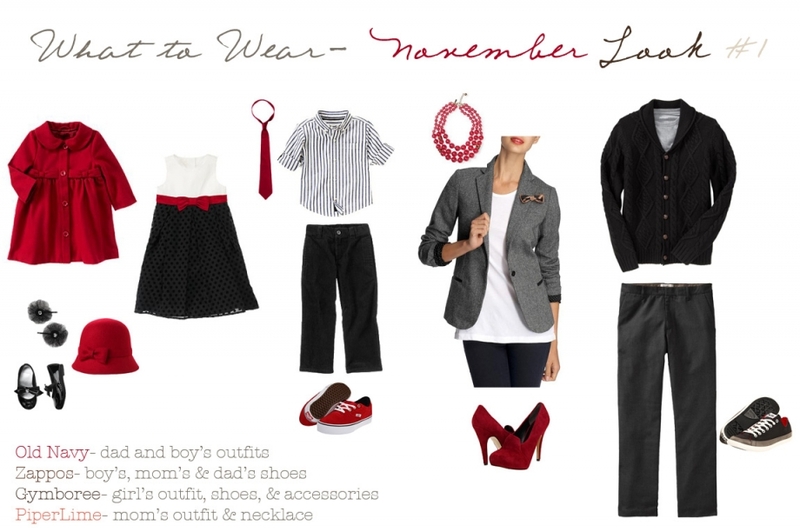 when choosing outfits for photographs think “coordinate” VS. matching. You will have a LOT more variety in your images. Not only that, typically I find that when everyone totally matches with either having the same print, colors, style, etc. subjects will just get lost in the image. You see a bunch of faces, but not much else. Nobody stands out in the pictures and everyone just ends up blending together. You always want there to be a pop, something interesting, something that draws your eye/attention in. So having “coordinating” outfits will allow everyone to “pop” in their own way when either photographed alone, with another subject, OR as a group. I also wanted to give people an idea of outfits that would work for those who don’t celebrate Christmas. I think I ended up coming up with some things that will hopefully work for people! Remember, pictures are about the subjects… the relationships, the bond, the love… and not necessarily the clothes. Clothes should accent, not be the focus of the image! When giving holiday cards out, people want to see your FAMILY. That’s it. Your FAMILY! Choose looks and outfits that show personality!!! Here are the looks I came up with for November! Corina…Thank you SO much for taking the time to put together these guides, and for sharing so generously with other photographers. This is so helpful! Thanks So much Corina ! Love these guides and thanks for linking the previous ones. Thanks for sharing! You rock! Thanks a ton! I gave you proper credit!! !